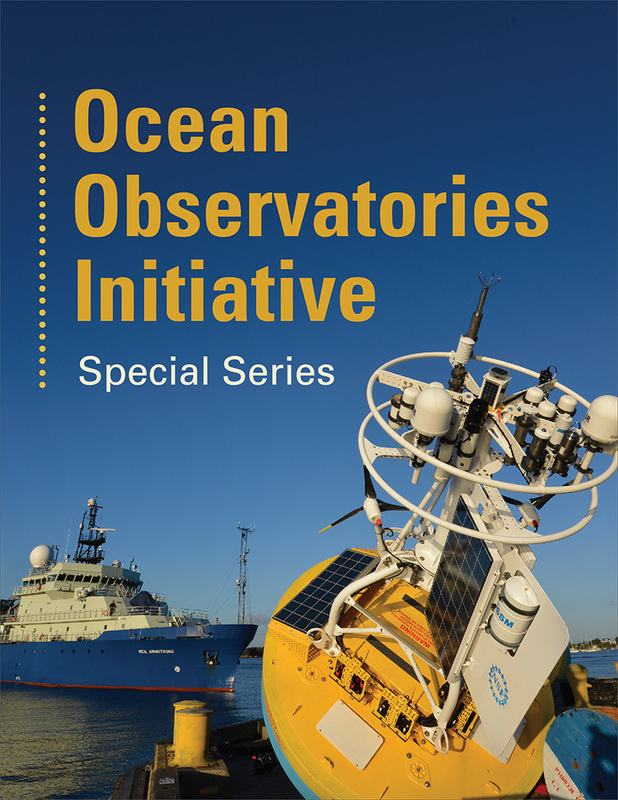 It took only a month for the new Ocean Observatories Initiative (OOI) to reveal insights about shifting ocean circulation patterns that could have major impacts on marine life and fisheries off New England. Ocean gliders patrolling the OOI Pioneer Array showed how large masses of warm, nutrient-poor Gulf Stream waters periodically intrude into cooler, shallow waters on the continental shelf. These intrusions disrupt conditions that usually support abundant fish, whales, and other marine life at the shelf break—the dynamic region where the shallow seafloor of the continental shelf begins to slope steeply into the deep ocean. But in 2006, scientists using satellite imagery observed an elongated body of warm Gulf Stream water pushing onto the edge of the continental shelf and intruding southwestward along the shelf break. The intrusion grew out of a phenomenon called a warm core ring: a rotating current that eventually pinched off from the Gulf Stream and headed onto the shallower continental slope. “A lot of people were surprised by this elongated intrusion of warm water,” said WHOI physical oceanographer Weifeng ‘Gordon’ Zhang. Satellite imagery showed five similar-looking intrusions between 2007 and 2014, each of which lasted weeks to months. Zhang and Gawarkiewicz dubbed these events “Pinocchio’s Nose Intrusions.” Like that fictional character’s elongating proboscis, the warm-water intrusions continued to grow—in their case, for hundreds of miles in a narrow strip from Massachusetts toward Cape Hatteras in North Carolina, moving in the opposite direction of the northeastward-flowing Gulf Stream. Because satellites can image only the ocean’s surface, scientists in 2006 couldn’t tell what subsurface processes might be causing the warm-water intrusions, or how deep the warmer temperatures extended. Then, in 2014, Pioneer Array gliders began missions across vast swaths of the shelf break, equipped with sensors to measure ocean currents, temperature, and salinity from near the surface down to the depths. The data showed Zhang and Gawarkiewicz that the warm-water intrusion extended down to depths of about 260 feet—almost to the seafloor of the continental shelf. 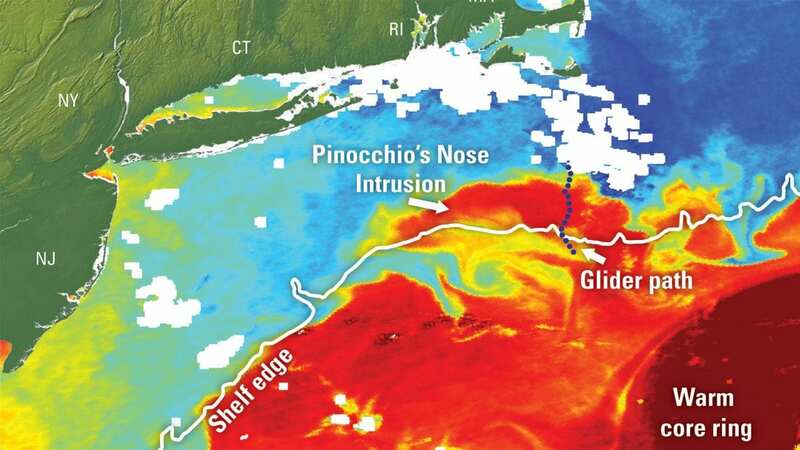 During the 2014 intrusion, water temperatures at the shelf break rapidly spiked from about 45° F to more than 70° F.
Pinocchio’s Nose Intrusions could have important repercussions for area fisheries. The spread of warm, nutrient-poor Gulf Stream water onto the shelf prevents cold, nutrient-rich water from upwelling to the surface. Fewer nutrients in surface waters at the shelf break could decrease the growth of microscopic plants and animals there, disrupting the food web in a region normally known for its rich biological diversity and fertile fishing grounds. But Pinocchio’s Nose Intrusions also could benefit some species, allowing warm-water fish to thrive in shelf waters north of their normal range. The intrusions also might help transport young American eels across the shelf break and onto the shelf, helping them to reach their freshwater coastal habitats. “There is a cascade of potential implications that need further study,” Zhang said. This research was funded by the National Science Foundation. Research findings were published in September 2015 in Geophysical Research Letters by Weifeng G. Zhang and Glen G. Gawarkiewicz.